First came pop-up retail, then pop-up eateries, and now we're getting into an age of pop-up services. I'm a fan of the whole concept and hope the trend continues. 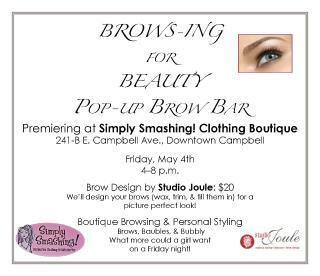 Studio Joule below is doing a pop-up brow bar in Downtown Campbell this Friday and is also doing a pop-up in Downtown San Jose this June. When: Friday May 4th, 2012. From 4:00 - 8:00 pm. Studio Joule and Simply Smashing will be combining beauty & fashion one evening. Beautiful brows, boutique browsing and personal styling.